Mayor Bowser has a plan to end homelessness. As part of that plan, her administration is transforming the shelter system to ensure that any family in the District that experiences a housing crisis has a safe, dignified place to get back on their feet. 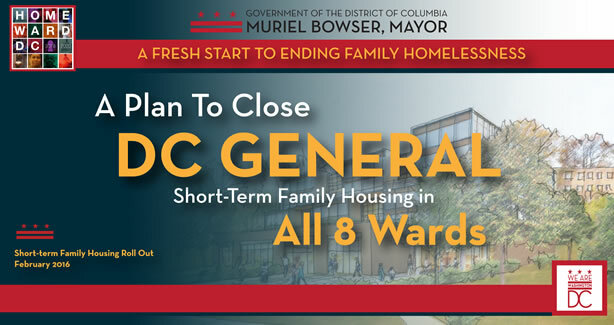 In October, 2018 Mayor Bowser delivered on her promise to close DC General Family Shelter once and for all. DC General was too big, too old, and too isolated to serve families. It its place, Mayor Bowser is developing a new Short-term Family Housing program in each ward. These neighborhood-based programs will provide wrap around services, 24/7 security, and a safe environment to ensure that families who have fallen on hard times have a fair shot at a second chance. Three Short-term Family Housing programs are already serving families. The Kennedy in Ward 4, The Horizon in Ward 7, and The Triumph in Ward 8 were opened by Mayor Bowser in fall 2018 and are operating with support from their new communities. In 2019 and 2020, the Mayor will open the final four Short-term Family Housing programs in Wards 1, 3, 5, and 6. What is Short-term Family Housing? Short-term Family Housing is dignified, service-enriched emergency shelter for families experiencing homelessness. Each Short-term Family Housing site will accommodate up to 50 families. The sites will be small, safe and clean with private rooms, and will give families a dignified place to stay until they get back to a place they can call home. Unlike DC General, these buildings have places for children of all ages to play and do homework. They also include the kind of services that help families exit shelter as quickly as possible. Because homelessness is an all eight wards problem, it requires an all eight wards solution. That is why Short-term Family Housing programs are being developed across the District. To ensure that every Short-term Family Housing program fits into the fabric of its community, Advisory Teams have been established in each neighborhood where Short-term Family Housing is being developed so that residents and civic leaders can help guide the development of each site. Learn more about Advisory Teams. Located at 2500 14th St NW, the Ward 1 Short-term Family Housing program will serve up to 35 families experiencing homelessness in apartment-style units. The Ward 1 program is projected to open in 2020. Learn more about the Ward 1 construction process. The Patricia Handy Place for Women opened in early 2016, and serves more than 200 women per night. Located at 3320 Idaho Ave NW, the Ward 3 Short-term Family Housing program will serve up to 50 families experiencing homelessness. The Ward 3 program is projected to begin serving families in 2020. Learn more about the Ward 3 construction process. The Kennedy, Ward 4’s Short-term Family Housing Program, opened its doors in fall 2018 and has capacity to serve up to 45 families each night. Located at 1700 Rhode Island Ave NE, the Ward 5 Short-term Family Housing program will serve up to 46 families experiencing homelessness. The Ward 5 program is projected to open in 2019. Learn more about the Ward 5 construction process. Located at 850 Delaware Ave SW, the Ward 6 Short-term Family Housing program will serve up to 50 families experiencing homelessness. The Ward 6 program is projected to open in 2019, and will include a garden level community health clinic. Learn more about the Ward 6 construction process. The Horizon, Ward 7’s Short-term Family Housing Program, opened its doors in fall 2018 and serves up to 35 families each night. The Triumph, Ward 8’s Short-term Family Housing Program, opened its doors in fall 2018 and serves up to 50 families each night.